Well, I was worrying a tad I would not have anything to write about for this issue, but something came up! It’s a strange one really, it all started off with the “other” family. Basically certain members of the family got too big for their shoes and thought it was a single stand alone family. This did not go down well with certain members, within Panthers Elite and they organised to have the family dropped. Because it wasn’t working as planned. This upset Carolina, she then refused to rejoin Panthers Elite. Later on in the evening GlowBulb killed a current member of Panthers Elite, Aplix, and then was dispatched by Head. KingDavid was shot by LuckyLuciano, who died in his backfire. This was how they responded to having their family dropped. After much discussion though out the day, regarding Carolina coming back to the family, and her deciding that she did not want to. Some members decided that they did not want to stay in the family without Carolina, and left to join her shortly after the original Panthers Elite (of the round) changed their name to Surreal Consequences, and a new family was made. Panthers Elite. The only real way Panthers Elite was going to fall this round, was by arguing between themselves and splitting up. This is exactly what has happened. How will the round play out now? Well we have about 100 days to find out! Getting exciting eh! In other news. KingSlayer has made rank 50. Again. Classy died in KingDavids backfire, and also Shitler was dispatched by Plainy (YEAH THAT’S ME!) after he had shot at walker with many o’s and x’s. Well! Before christmas, there was a promise from the Jordan clan to do a times issue. So a month later, here it is, with the Mikeys aswell! So, this is my first interview in a long time. What has happened? Have I lost my touch? Read and decide for yourselves! Today in a session with Plainy we have Phizz, most commonly known as Phizzent of Phil joining me in the not so comfy chair. So lets do this shall we? Plainy: Good evening and welcome to “A Session with Plainy” how are you today? Phiz: I'm not too bad, yourself? Plainy: I’m dandy thanks. So lets get the big question out of the way, what do you think of the round so far? Phiz: So far it has been pretty shocking really, the things that have happened in my opinion has set someone up, but can't prove it so its best left behind i suppose. Other than that, its been quite interesting. Plainy: Why do you think it’s been shocking? And who has been set up? You can’t just leave it like that! Well, I suppose he can just leave it like that. He has quit the game, never bother replying to me when he has been online. Rather rude. I want to know more, you know more? Message me! So, for all you budding gangsters in the world. Here are the answers to the GN challenge from last week! 2) How old is Rey? Really? 3) Is Gromit a dog of a cat? 4) What is 163 X 431? 5) What was the order that the emperor issues in Revenge of the sith? 7) How many families have their been so far this round (day 37)? 8) How many of those families have PE taken out? 10) What is the square root of 49? Welcome to the General News section with me, KingSlayer!. And that's all the general news for this issue! The GN challenge for this issue, worth once again is $1,000,000 is this! I want you to message me with the funniest joke you know! Easy as that, Message me with it, and it will be in the next issue. So, nice and easy, your best joke, and in the next issue, the winner will be announced and you will receive your $1,000,000. I will choose an expert judging panel to make the choice, but go ahead and have a go! Good luck! Well, after the fail of the last interview, going to try this one out now. Plainy: Good evening and welcome to a Session with Plainy, how are you today? Plainy: Yeah I can imagine, would you like to give us the low down of events from your point of view? Plainy: But that's boring and people want to know what happened! 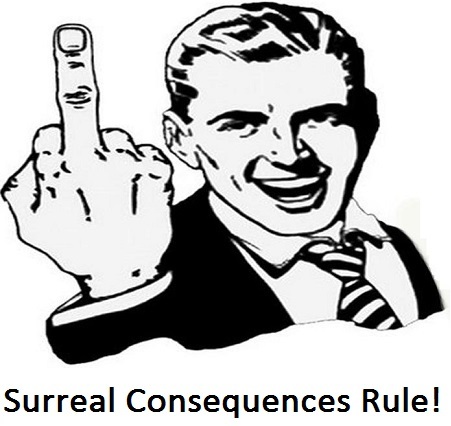 Plainy: Do you think that Surreal Consequences is any worse off now you and a few other members have left? And do you think you’ve made yourself an easy target? Plainy: But you have made yourselves more of a target? There is a lot of hate towards PanthersElite, and people will surely take advantage that both yourself and your boss are in range of 20 ranks. Plainy: Fair point, one more question regarding whats happened I promise! Do you think you’ll come to regret your decision? KingDavid: nah, i love both fams. Would have loved for it to grow more, but then who else would be competition? Plainy: Superb! Right onto the important stuff. Is your name Jack or David? KingDavid: Real name David, Just liked the Character JackSkellington so i stood with jack ? Plainy: Okay, time for some questions from the players! Dirk: Did you leave just to get the gold family guy medal? Plainy: Sammie wants to know, which old school player are you glad to be back playing on GN? Plainy: One last question. This one is from KingSlayer. Wasn’t sure if I should put this in, but I am! Why did you agree Elite Panthers should be dropped then sided with Carolina when she was angry it had been dropped? KingDavid: I agreed the fam was needed to be dropped, but wasnt entirely up to me. No offence to myself but when am i ever really asked and taken into consideration in decisions like this? I left with beth because to begin with i joined Panthers Elite...not nicks fam and co. which i dont regret cause i love you all, but i was originally there because beth had asked me and as much as the game has lost their loyalty. I havent? Plainy: Well hopefully that will answer some peoples questions and give a few others some more answers. Sweet Jesus we've had 2 issues in the space of a week! Seriously thought, what is going on? My last issue got 5 stars out of 5 stars. A first in the history of GangsterNation! Thank you all for your voting, and thank you all for reading, hope you enjoyed it! Do you have some gossip? Message Plainy and it might appear in the times! Do you want to be part of guess the gangster? Then message me with your picture, and some clues about you! Finally, do you have what it takes to be a sub editor? Then once again, MESSAGE ME! This issue has been viewed by 98 players and rated by 20 players.